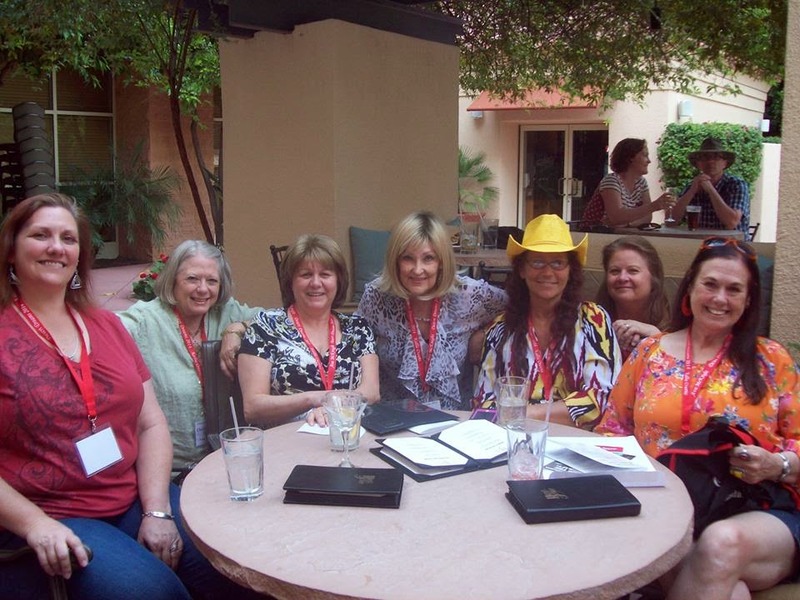 I spent this past weekend at the Desert Dreams Conference held here in beautiful Tempe, Arizona….and, as in years past, it was a wonderful weekend. The workshops were fantastic, the hotel was great, and the people…well, they were all so wonderful. There is such a sense of community and camaraderie within the writing world. No one is a stranger…just someone you haven’t met yet. The advice and the help flows freely from those who have had more experience in the writing world to those who are just starting out and everyone inbetween. The book signing was awesome as well! The keynote speaker, Christie Craig, brought us to tears with her story then left us feeling like we could do anything. And I mean anything! Best of all, I was able to spend time with friends, talking all things writing and laughing. Oh my, did we laugh! The fabulous Alexis Walker and her equally fabulous hubby flew in from their island paradise to attend, too! Leaving you with a picture taken the first night. Don’t we look happy? And anxious to learn? So good to see you in the pictures! What was the most interesting thing or the "something" you want to remember or re-focus on when you write after this conference?